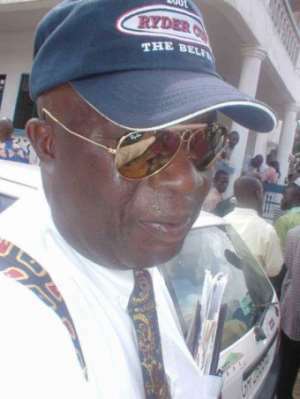 Accra, May 30, GNA - Mr Chuck Kofi Wayo, who lost his bid to become the People's National Convention's (PNC) presidential candidate to Dr Edward Nasigrie Mahama, said he spent over 400 million cedis on his campaign and in support of the just ended National Delegates Congress because he believed in the Party. Mr Wayo who joined the PNC barely five months ago, rebuffed criticisms that he acted as an opportunist by seeking the topmost position in the Party. "If I were an opportunist, I would not have spent over 400 million cedis helping to convey Party delegates from all over the country, accommodating and feeding them although I knew they were more likely to vote for Dr. Mahama." Mr Wayo obtained only 14 per cent out of a total 888 votes cast, against Dr Mahama's 755 votes or 85 per cent. He blamed his defeat on what he called "the Ghanaian backward mentality and lack of adventure on the part of the delegates." He said while on his campaign trips, the people told him they needed change "and I assured them of change but obviously they have proved that they are not adventurous enough to go for the change they needed." Mr Wayo, who earlier told the GNA that he was not in control of the Party and therefore could not immediately know his fate should he lose his bid for the presidential slot, later told Journalists that he was hopeful that he would be Dr Mahama's running mate if the Grand Coalition elected Dr. Mahama as its flag-bearer. "I love Dr. Mahama although I believe that I have more fire than he has and I am willing to support him all they way to ensure that we wrestle power from the hands of the NPP in the 2004 elections." Mr. Wayo said he was not too enthused about the idea of Grand Coalition and "the whole issue of the unity of the Nkrumahist parties in the country". However, he said he shared Dr Mahama's belief in providing jobs for the people and changing their lives for the better. "If Dr. Mahama believes that the unity of Nkrumahist is the way to ensure that then I am with him." He said personally, he was interested in getting the power to cut down on the number of government ministers and more so to fire inefficient ministers and state functionaries anytime there was the need, "unlike the ruling government who worked with 90 non-performing ministers and cannot even fire them when they do not deliver." Wayo said he believed in the ability of the Ghanaian to change his or her own circumstance, and that he would continue to fight for power until he got the mandate to help Ghanaians bring out their potential. The Chairman of the party, Dr Mike Mensah-Bonsu, who was retained unopposed in absentia, said in a speech read for him that the mandate given the new Executive required hard work, including the mobilization of financial and human resources to organize the Party to wrestle power from the NPP in this year's elections. "This is neither a tea nor a coca-cola party, but a difficult one, which demands that we win power in 2004 and retain it in subsequent years," he said. Dr Mensah-Bonsu said the NEC would strive to maintain discipline in the Party.